According to a Yachting World, April 1952, p. 179, the designer (and builder) is Bjarne Aas. This is confirmed by the Dutch magazine De Waterkampioen, nr. 900, April 1952, p. 148, although the author says that "another name was mentioned, too" ("al werd ook een andere naam genoemd"). K-9 is Achtung, owner E.B.N. ("Tiny") Mitchell. 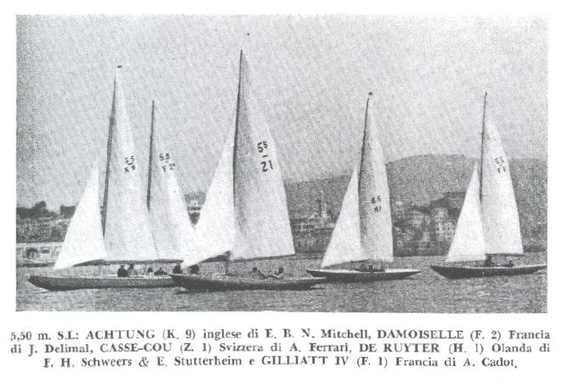 In the Italian magazine Vela e Motore, april 1952, p. 98, there is a photograph of one of the Genoa races, showing K-9. In the text with the photo the boat is said to be Achtung; this was the only British boat in the 1952 races at Genoa.